L to R back: Vic Williams, Dave Paul, Freddie Keil, Billy Belton, Jimmy Murphy, front Dave Smith and Brian Smith. Freddie Keil had originally been the lead vocalist with the Keil Isles up until 1960, when he had a disagreement with cousin Herma Keil and decided to leave the group and form one of his own. 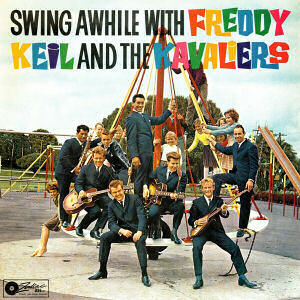 Initially his group was called the Zodiacs, until he changed it to Freddie Keil and the Kavaliers. The Zodiacs originally consisted of Freddie on vocals, Murphy on lead guitar, Williams on drums, John 'Yuk' Harrison on bass, Jimmy Langabeer on piano and Alphonso Keil on rhythm guitar. Initially they had plans to record for the La Gloria label, but when that fell through, they went to Zodiac and changed their name to avoid confusion. Terry Fidow (better known as Terry Dean of Terry Dean and the Nitebeats) did a few guest vocal spots with the Zodiacs when Freddie went back to Samoa for a short visit. At the time of the change, Alphonso left and joined Sonny Day and the Sundowners, as did Harrison. Dave Smith replaced Jimmy Langabeer, Brian Smith took over from Harrison, Billy Belton for Alphonso, and Dave Paul was added on saxophone. Dave Paul was the only saxophone player to remain for a long time. Others came and went, some being Marsh Cook and Kevin Ranginui. Helga Keil also sang occasionally with the band. When Jimmy Murphy left he was replaced by Billy Peters. Freddie Keil and the Kavaliers were a very professional group that wore two-toned satin cowboy-style shirts on stage, and then later moved to more flashy Italian cut suits. They played at a number of youth clubs and also secured a residency at the Shiralee. The group ventured to the Waikato and Taranaki areas on a regular basis and provided backing for Benny Levin's artists on his package tour in 1964. They released 11 singles for Zodiac between 1960 and 1965, as well as an album in 1963 called "Swing Awhile With Freddie Keil and the Kavaliers". Near the end of their time, they made a few appearances on TV's "C'mon" show, but their real problem was that they could not compete with the new sounds and style of groups like Ray Columbus and the Invaders and Max Merritt and the Meteors. They disbanded in 1965. Billy Belton went on to form the Newsounds and then also formed Ray Woolf's Avengers, and Vic Williams later played with Salty Dogg in the seventies. Freddie moved back to the Islands where he owned an FM Radio Station until his death in late 1994.